Azure Monitor now supports enhanced capabilities for managing your alerts at scale, including those generated by monitoring tools like SCOM, Zabbix or Nagios. The Alert Management solution helps you analyze all of the alerts in your Log Analytics repository. These alerts may have come from a variety of sources including those sources created by Log Analytics or imported from Nagios or Zabbix. The solution also imports alerts from any connected System Center Operations Manager management groups. The solution works with any records in the Log Analytics repository with a type of Alert, so you must perform whatever configuration is required to collect these records. For Log Analytics alerts, create alert rules to create alert records directly in the repository. For Nagios and Zabbix alerts, configure those servers to send alerts to Log Analytics. For System Center Operations Manager alerts, connect your Operations Manager management group to your Log Analytics workspace. Any alerts created in System Center Operations Manager are imported into Log Analytics. Add the Alert Management solution to your Log Analytics workspace using the process described in Add solutions. There is no further configuration required. If your System Center Operations Manager management group is connected to your Log Analytics workspace, then the following management packs are installed in System Center Operations Manager when you add this solution. There is no configuration or maintenance of the management packs required. For more information on how solution management packs are updated, see Connect Operations Manager to Log Analytics. The following table describes the connected sources that are supported by this solution. Windows agents No Direct Windows agents do not generate alerts. Log Analytics alerts can be created from events and performance data collected from Windows agents. Linux agents No Direct Linux agents do not generate alerts. Log Analytics alerts can be created from events and performance data collected from Linux agents. Nagios and Zabbix alerts are collected from those servers that require the Linux agent. System Center Operations Manager management group Yes Alerts that are generated on Operations Manager agents are delivered to the management group and then forwarded to Log Analytics. A direct connection from Operations Manager agents to Log Analytics is not required. Alert data is forwarded from the management group to the Log Analytics repository. Alert records are available to the solution as soon as they are stored in the repository. Alert data is sent from the Operations Manager management group to Log Analytics every three minutes. When you add the Alert Management solution to your Log Analytics workspace, the Alert Management tile is added to your dashboard. This tile displays a count and graphical representation of the number of currently active alerts that were generated within the last 24 hours. You cannot change this time range. Click on the Alert Management tile to open the Alert Management dashboard. The dashboard includes the columns in the following table. Each column lists the top 10 alerts by count matching that column's criteria for the specified scope and time range. You can run a log search that provides the entire list by clicking See all at the bottom of the column or by clicking the column header. Critical Alerts All alerts with a severity of Critical grouped by alert name. Click on an alert name to run a log search returning all records for that alert. Warning Alerts All alerts with a severity of Warning grouped by alert name. Click on an alert name to run a log search returning all records for that alert. Active SCOM Alerts All alerts collected from Operations Manager with any state other than Closed grouped by source that generated the alert. All Active Alerts All alerts with any severity grouped by alert name. Only includes Operations Manager alerts with any state other than Closed. If you scroll to the right, the dashboard lists several common queries that you can click on to perform a log search for alert data. The Alert Management solution analyzes any record with a type of Alert. Alerts created by Log Analytics or collected from Nagios or Zabbix are not directly collected by the solution. AlertContext Details of the data item that caused the alert to be generated in XML format. AlertDescription Detailed description of the alert. AlertId GUID of the alert. AlertName Name of the alert. AlertPriority Priority level of the alert. AlertSeverity Severity level of the alert. AlertState Latest resolution state of the alert. LastModifiedBy Name of the user who last modified the alert. ManagementGroupName Name of the management group where the alert was generated. RepeatCount Number of times the same alert was generated for the same monitored object since being resolved. ResolvedBy Name of the user who resolved the alert. Empty if the alert has not yet been resolved. SourceDisplayName Display name of the monitoring object that generated the alert. SourceFullName Full name of the monitoring object that generated the alert. TicketId Ticket ID for the alert if the System Center Operations Manager environment is integrated with a process for assigning tickets for alerts. Empty of no ticket ID is assigned. TimeGenerated Date and time that the alert was created. TimeLastModified Date and time that the alert was last changed. TimeRaised Date and time that the alert was generated. TimeResolved Date and time that the alert was resolved. Empty if the alert has not yet been resolved. 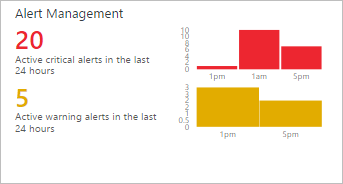 Learn about Alerts in Log Analytics for details on generating alerts from Log Analytics.